This is after Jorge Sampaoli led Lionel Messi and co to a frustrating World Cup outing in Russia where they nearly crashed out on group stages. 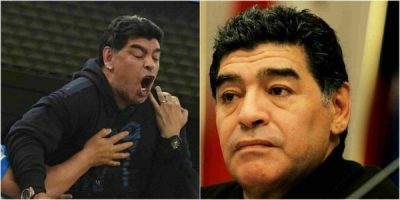 Maradona made the offer when he appeared on his “Hand of God” television show, where he also said it was painful to see the current state of the national team. “I would return to leading the national team and I would do it for free, I wouldn’t ask for anything in return,” the 57-year-who coached Argentina for two years from 2008-10, said on the programme which runs on Venezuelan channel Telesur. Maradona’s World Cup coaching campaign in 2010 ended in an ignominious 4-0 thumping by Germany in the quarter-finals in South Africa. Maradona, who has been able to ward away controversies from himself was recently slammed with a ban from FIFA over his unrul behaviour during his country’s game with Nigeria. Maradona was captured on camera giving the Nigerian team a middle finger.